January is most people’s least favourite month. The return to work, dark mornings and nights and the cold weather leaves many feeling down and out and wistfully thinking about warm summer evenings spent in the garden. In addition, with over half of Britons who consider themselves to be stressed, how can we help to solve this problem and leave the nation feeling less stressed and more relaxed? The Danish concept of Hygge could be the perfect solution! This concept has crossed continents and is now an extremely popular lifestyle choice and home decor taste across Europe. Scandinavia is a place well-known for it’s long, harsh winters during which inhabitants see very little daylight. However, Denmark’s population remains one of the happiest in the world and many put this down to their way of life. Hygge was originally a Norwegian term for wellbeing and was developed into a way of life by the Danish. In English, the term translates into cosiness and togetherness. It’s hard to find a literal translation but it’s usually interpreted as a mental state of feeling relaxed and cosy rather than a physical feeling. However, there is a particular style of living and home decor associated with Hygge so, how can you introduce a little bit of the style to your home in order to create a safe haven? One of the main keys to Hygge is enjoying your environment and that means getting your home decor just right. Turn every room in your home into a sanctuary that you can relax in at any given moment and fill it with key items which will allow you to do so. 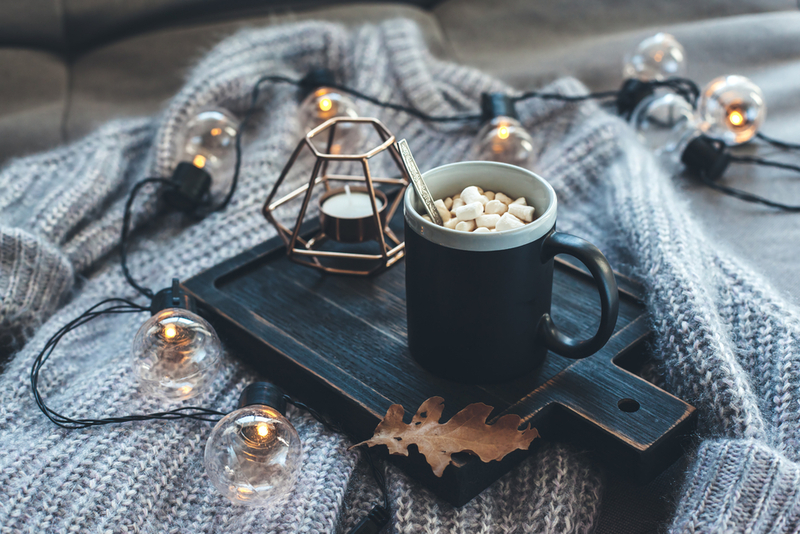 Hygge should allow you to enhance your wellbeing by changing your everyday environments, therefore relieving those feelings of needing to escape from the stresses of life and improving your overall stress levels. Anyone who lights a candle or a fire at home will know that that warm glow just cannot be replicated with artificial lighting. Candles help you to create a softer and kinder light source which is perfect for relaxing and socialising. Hygge mixes materials and patterns in order to add character and interest to what could otherwise be a very minimalist and cold interior decor style. By introducing warm, natural materials into your home such as wood, leather and wool, you will start to create a Hygge effect and add extra depth to neutral and minimalist colour schemes. Remember that the overall look should all still tie in together and follow the same colour palette to prevent colours from clashing or being too distracting. Add texture in the form of fur rugs and large, chunky knit blankets, all of which will help you to create a lived-in feel, making you feel even more at home and relaxed. Scandinavians also draw on the nature outside their homes for decor inspiration, making house plants and flowers extremely popular within their decor styles. Neutral colours are the theme for Hygge home interiors because they’re soft, warming and don’t distract your attention. Light shades of grey, white and cream will create a sense of calm and tranquillity in your home. As we mentioned before, texture can be added using accessories around the room. At Blinds Direct Online, we stock a wide range of neutral coloured blinds to help you create your own Hygge home. Try our Iron Roller Blind for a deeper shade or our Grey Vertical Blind to add natural tones to your home. As natural light is rare in autumn and winter in Scandinavia, windows are an important feature in order to allow as much light in as possible. Blinds are a great way to allow natural light to flood into your home but retain privacy at the same time. Don’t let clutter weigh down your mood or make you feel stressed. Hygge’s signature design style is keeping it simple. Decluttering will also help you to feel relaxed and free from the stress of the day, letting you feel truly comfortable and warm. Our range of perfect fit blinds are perfect if you want to keep your windowsills clutter free and embrace the simple Hygge life! They fit perfectly into your windows and give you full control over exposure to sunlight and privacy in your home.